. How you can help WCSUK raise awareness. There is no national womb cancer awareness campaign so. 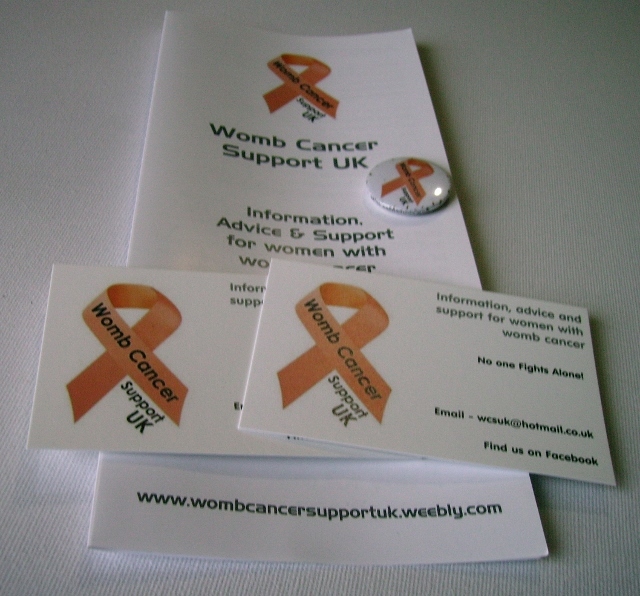 for over 6 years now, WCSUK has been working hard to raise awareness of womb cancer by doing what we can to share information about the signs and symptoms and the risk factors to be aware of. WCSUK is a small not for profit organisation and we rely on our supporters and likers to help us spread the word. 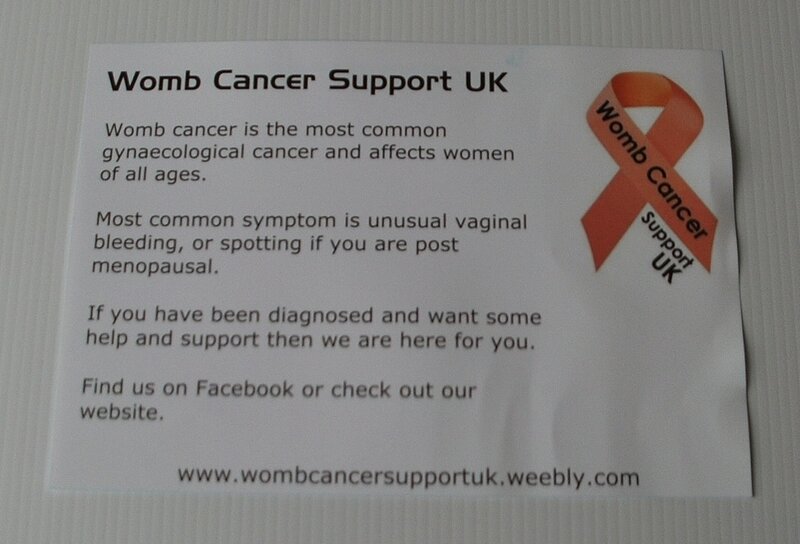 There are many ways that you can help us raise awareness of womb cancer. 1. Share the link to the Facebook page and share our comments. 4. Follow us on Twitter and help spread the word! 5. Distribute some of our business cards at your next appointment. They are great to hand out to your CNS; Macmillan nurse; GP; Consultant etc. Just email me your address details to wcsuk@hotmail.co.uk and I'll pop some in the post to you. 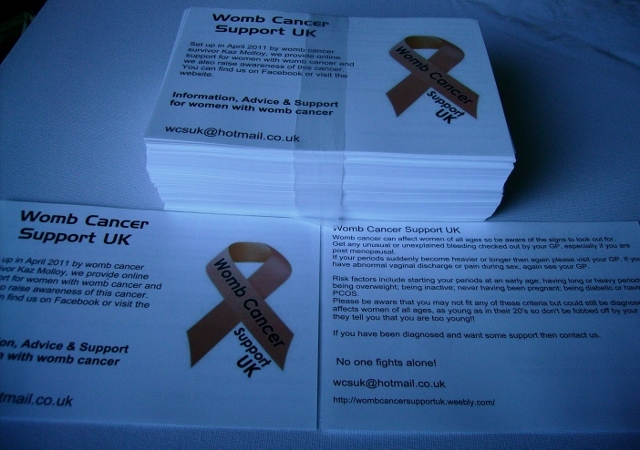 We also have awareness leaflets that explain the signs and symptoms of womb cancer and are great for GP surgeries, clinics, etc. 6. Do you know anywhere that would display one of our posters? Ask at your local health centre, surgery, clinic, library, gym etc. Maybe a noticeboard at work or your local community centre. 7. Organise an awareness event - maybe a coffee morning or a stall at a local health event or in your library. 8. If you are thinking of doing CRUK Race for Life then dress in peach (womb cancer awareness colour) it will raise awareness and get people interested. 9. If you have been diagnosed would you be prepared to share your story to help raise awareness? You could do a guest blog post for the website. Email me at wcsuk@hotmail.co.uk for more details. 10. If you have any media contacts then please get in touch. 11. If you are good at graphic design then you could help us produce some promotional stuff. Again please get in touch.